Motorola's new Android-based smartphones have been found in China called Domino + (or XT531), Android phone is currently released only in the Chinese market and will be aimed at the smartphone buyers with limited budget. Domino + Motorola will have a 3.5-inch screen HVGA specification, a Qualcomm MSM7227 800MHz processor with 512MB of RAM and ROM memory, 5 megapixel camera with LED flash along with Bluetooth, WiFi and GPS. 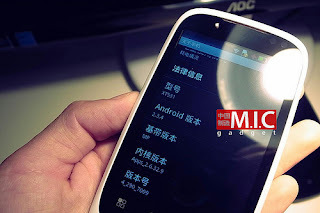 Domino Motorola + Android will run on OS 2.3.4 Gingerbread. Wrapped in a glossy white plastic, Domino + does look very pretty and different designs that are different from Motorola's usually only displays black color design-hitam.Motorola + Domino will be released some time to come in August at a price of about 2198 Chinese yuan ($ 341).